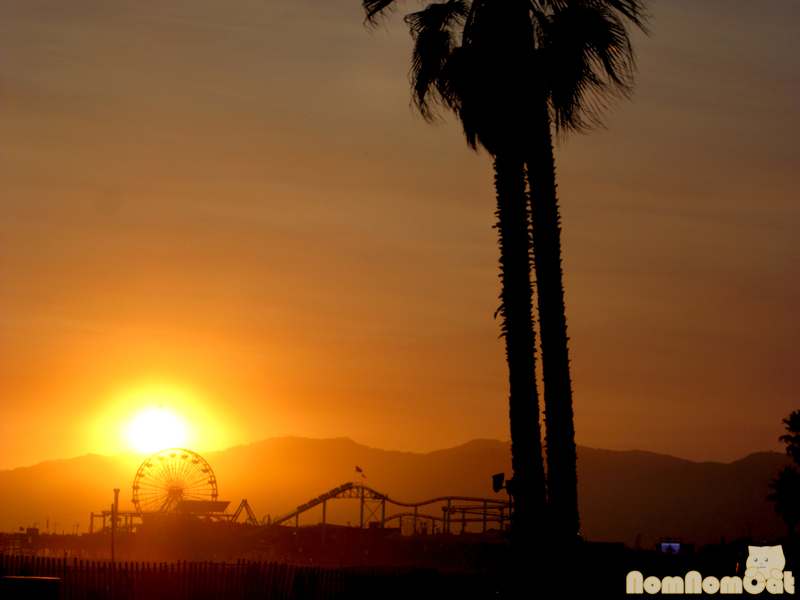 Drive west far enough on any of the streets in Santa Monica and before long you’ll find the beach. Cass and I were scoping out some beachfront locations and decided to stop in at Coast for happy hour which runs from 4pm-7pm, Monday through Thursday at the bar. Located in the beautiful Shutters on the Beach hotel, immediately adjacent to Casa Del Mar, Coast offers ocean views, fresh seafood, and great mixed drinks. Bonus: the happy hour menu features special pricing on appetizers as well as house wines and select cocktails. Cass and I like to plan ahead, so when the bartender asked us what we would like from the happy hour menu, we said “One of everything!” Really. I’ve always wanted to do that. 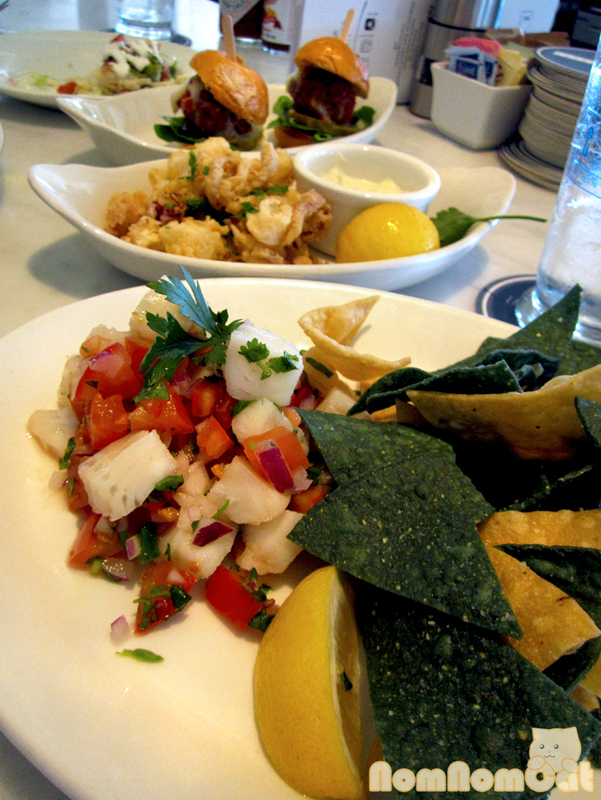 In fact, for the fish tacos and oysters, we had to order two. The bartender chuckled as she entered our order in the POS. 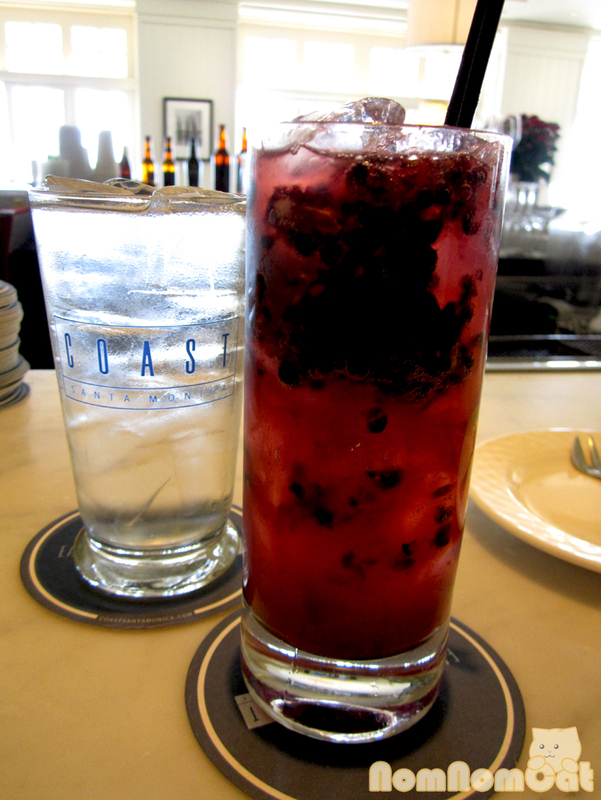 To celebrate it being Thursday, I ordered a Blackberry Bramble – Hendricks gin, lemon juice, agave, blackberries. I had spotted it when I first glanced at the menu and knew I had to try it. Full of muddled blackberries and a generous pour of refreshing cucumber gin, this drink was perfect for enjoying the beautiful summer day. 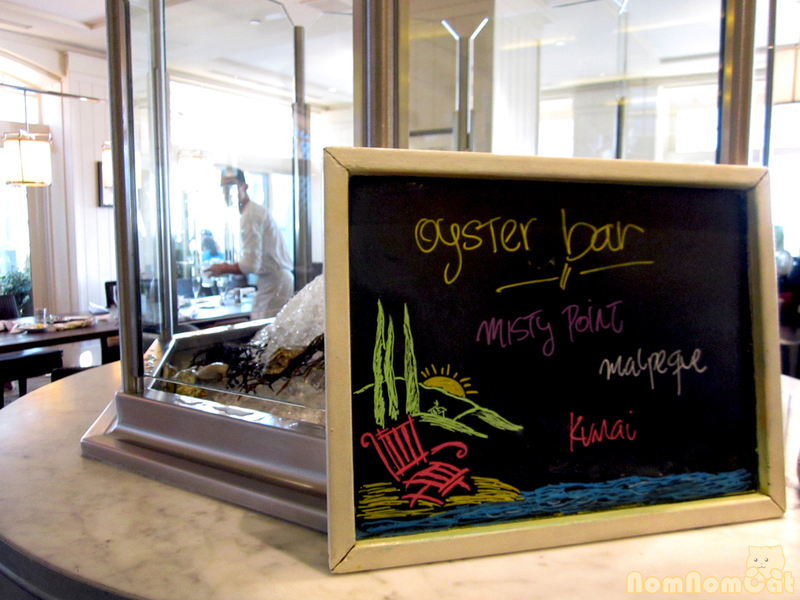 We ordered two of the Oyster of the Day (Misty Point, I believe). Shucked to order and nested on a bed of crushed ice, the oysters were served with a spicy cocktail sauce and a vinegary tart mignonette. 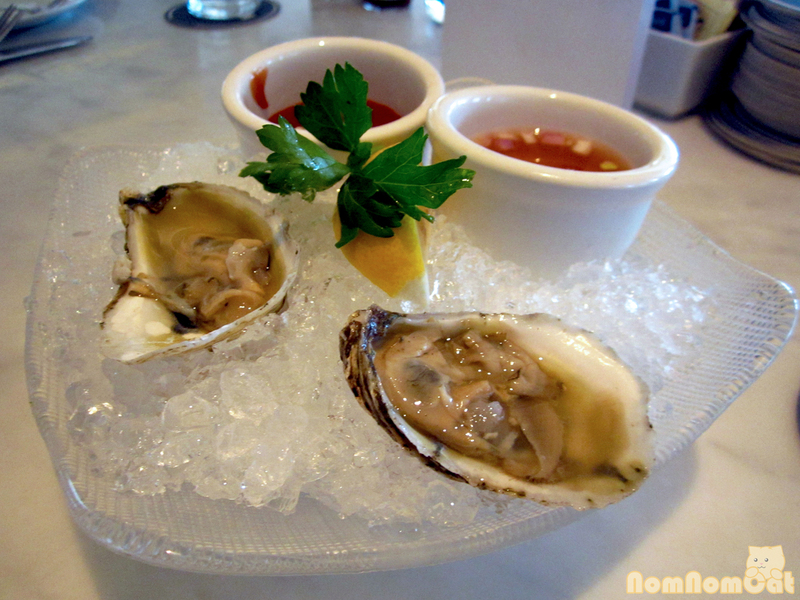 Not too sweet and not too briny, these oysters were a great way to whet our appetite for the fried goodies to come. 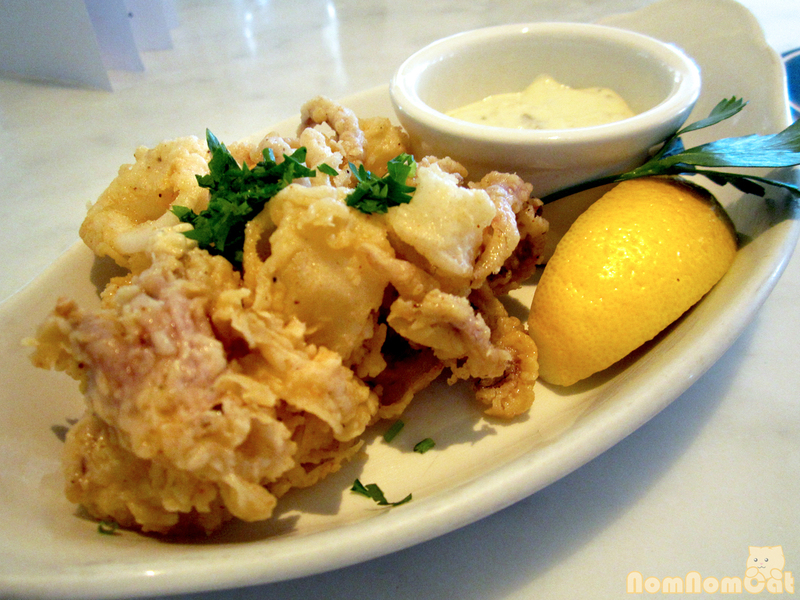 The fried calamari were crispy with a light coating of batter and a tangy house-made tartar sauce. These were good but not particularly special, and personally I prefer my calamari with a bright marinara sauce rather than a creamy tartar. Grilled fish tacos (by far my favorite over the deep-fried kind) on a house-made corn tortilla and topped with pico de gallo, guacamole, sour cream, and shredded lettuce. 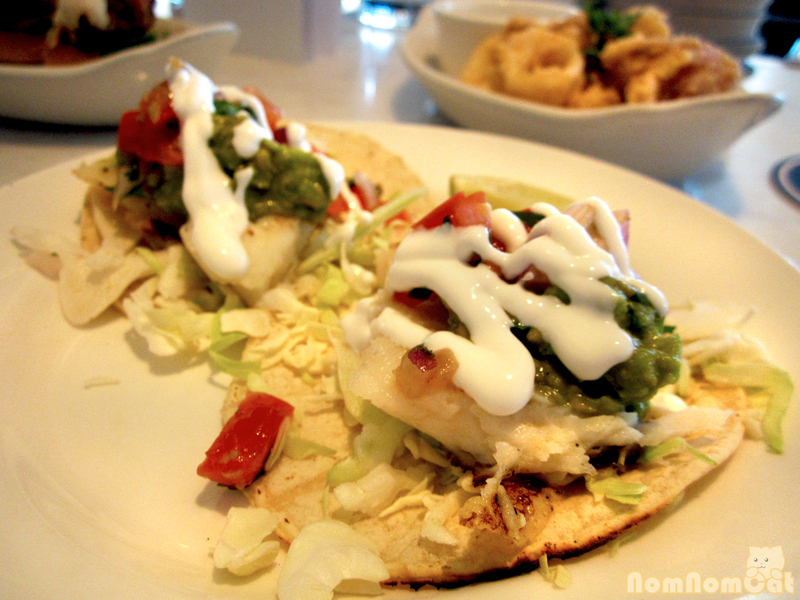 The epitome of California beach cuisine, these fish tacos made us feel right at home. 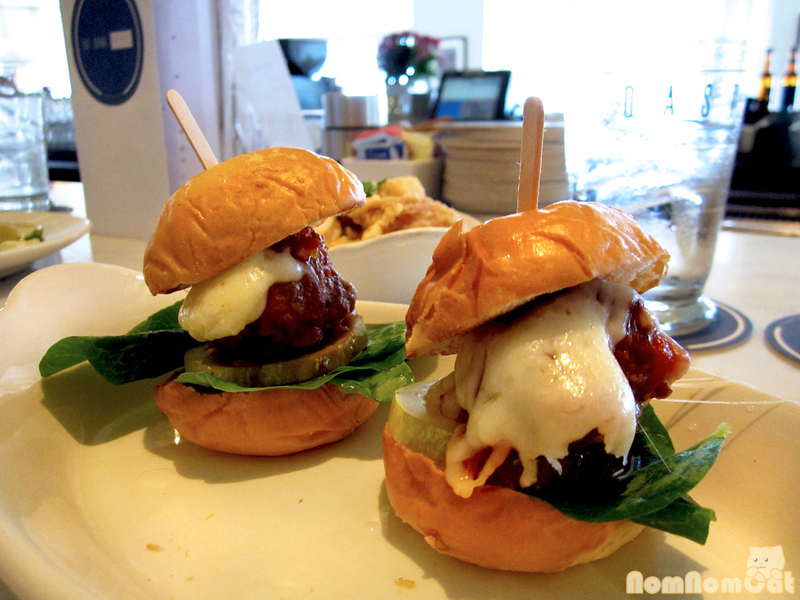 These sliders were Cass’ favorite dish of the night – a pair of little round buns sandwiching savory, moist meatballs completely enrobed in melted, stringy provolone cheese, layered with a thick dill pickle slice. Taking the first bite was a bit of a challenge (it’s so tall!) but it’s well worth the effort to get a bit of everything in each bite. This was my favorite dish of the evening. With hearty, sizable chunks of white fish marinated in lime juice with diced tomato, brunoise of shallots, and plenty of cilantro, the ceviche was the perfect light and refreshing summer dish. The warmed tortilla chips, in both regular and blue corn, added a colorful contrast. 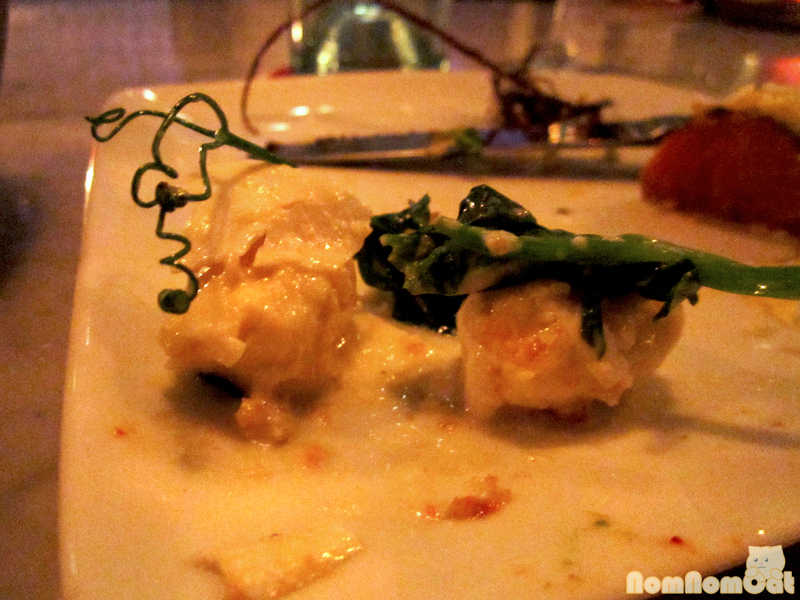 Both of us agree that our second favorite of the night was the corn meal crusted rock shrimp. 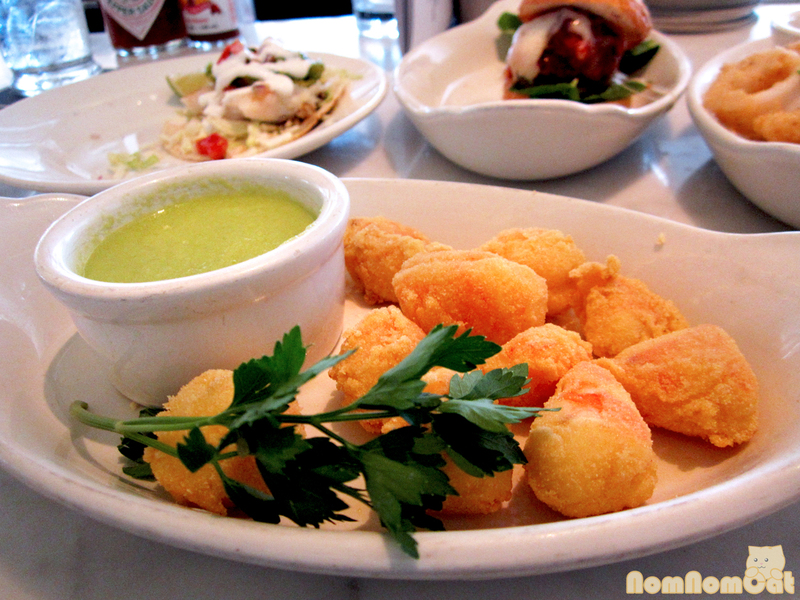 Nuggets of fresh, sweet shrimp coated in a thin crispy layer of corn meal (and fried, of course), these were too easy to just pop in your mouth and devour them all! 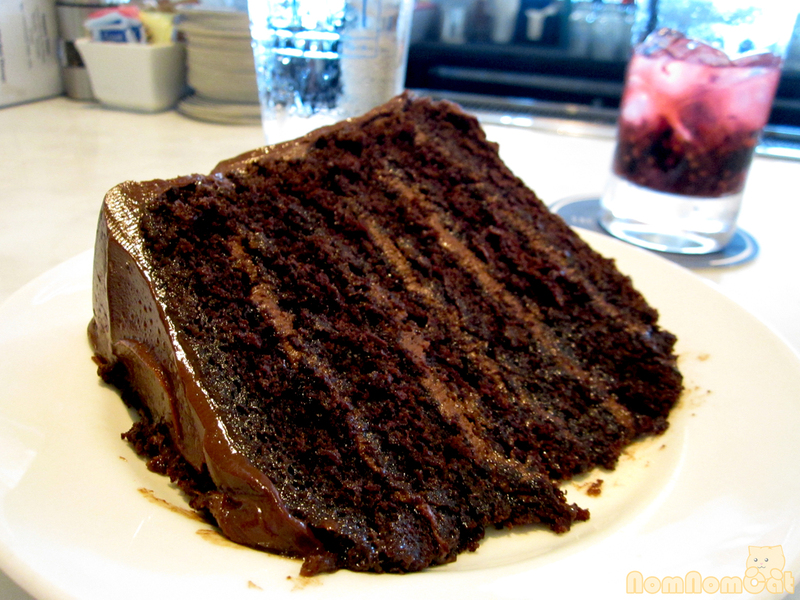 …the Old Fashioned Six Layer Chocolate Cake from SusieCakes in Brentwood. 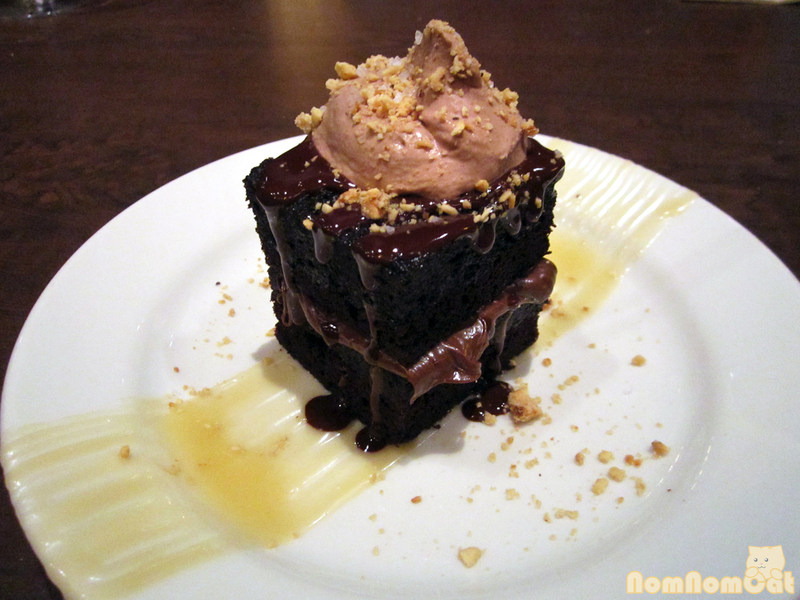 An impressive monstrosity of super moist semisweet chocolate cake, thick and velvety ganache, and a thin layer of sugary frosting, this dessert was exactly what we needed to finish our meal. 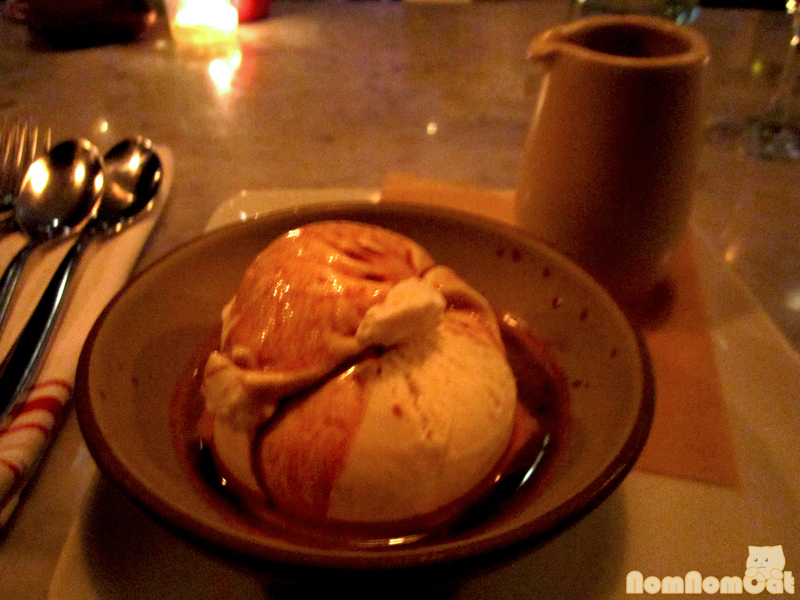 Surprisingly, it was not too sweet despite being so decadent and satisfying. 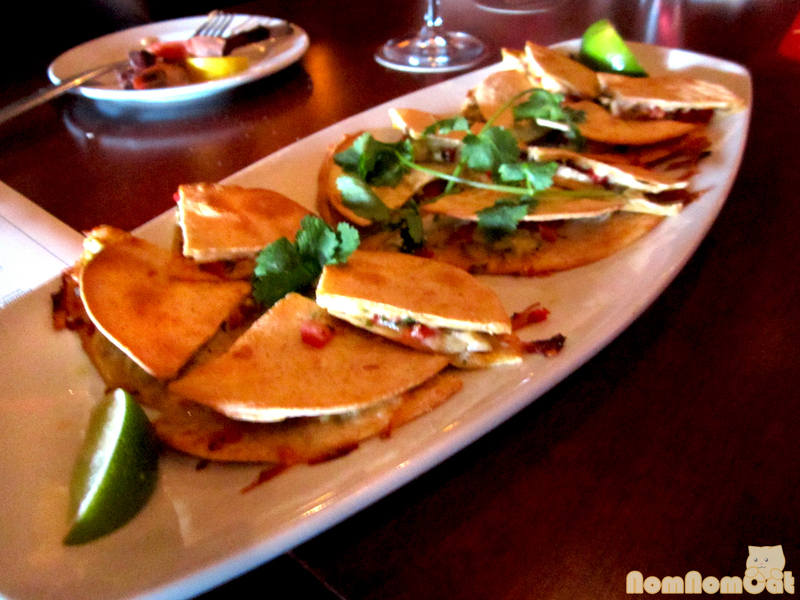 The offerings on the happy hour menu here are Coast are perfect for sharing with a friend. 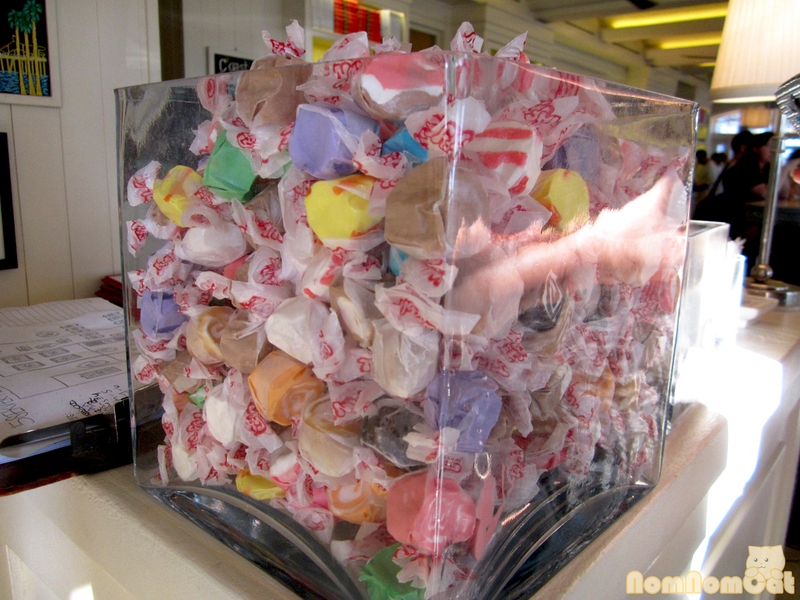 We were glad to have had the opportunity to try all of the delicious appetizers and by the time we polished off the last bite of cake, we were stuffed, though not too full for just one more little treat — a colorful piece of saltwater taffy! If you live or work in the Santa Monica area, definitely mosey on by to Shutters on the Beach and enjoy sunshine and HH here at Coast. 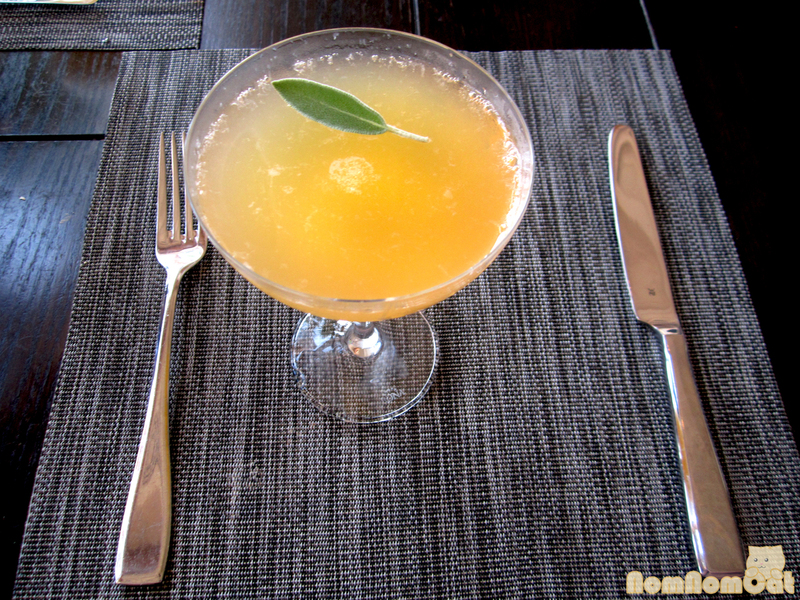 It’s that time of year again — summer dineLA restaurant week! A time for great deals, checking out new restaurants, and going out in the middle of the week for more than just happy hour. Last week, Martin met up with his best friend at Le Ka in Downtown LA while I had a girls’ night out with Cass at Catch in Santa Monica. 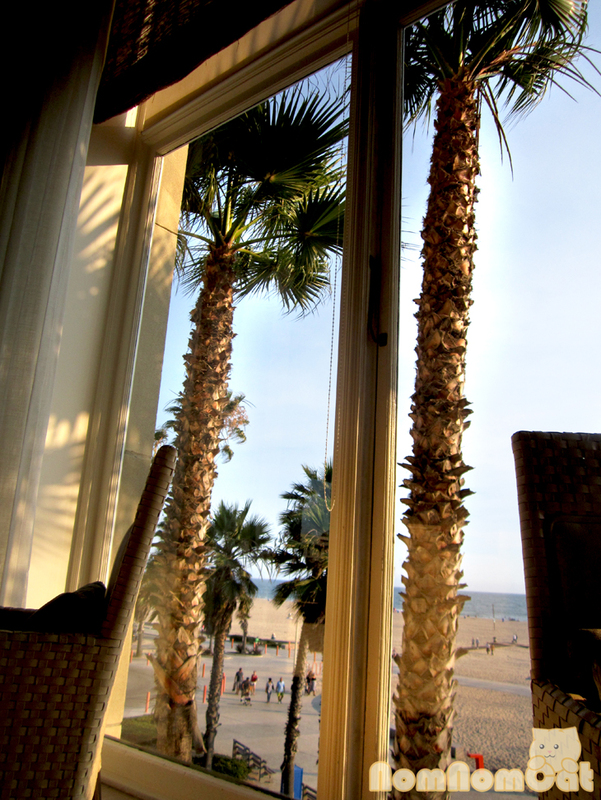 And what a catch it truly was – located in the lobby of Hotel Casa del Mar, the beach-front view was gorgeous and the ocean breeze reminded us of why we love LA. We each ordered the same crafted cocktail: The Perfect Pair – hendricks gin, fresh muddled pear, lemon juice, pear juice, thyme. I love Hendricks and as Cass pointed out, this mixed drink was refreshing and naturally sweetened with plentiful fresh pears. Highly recommended! In retrospect, the table bread was definitely an indicator of the quality of the meal to come. 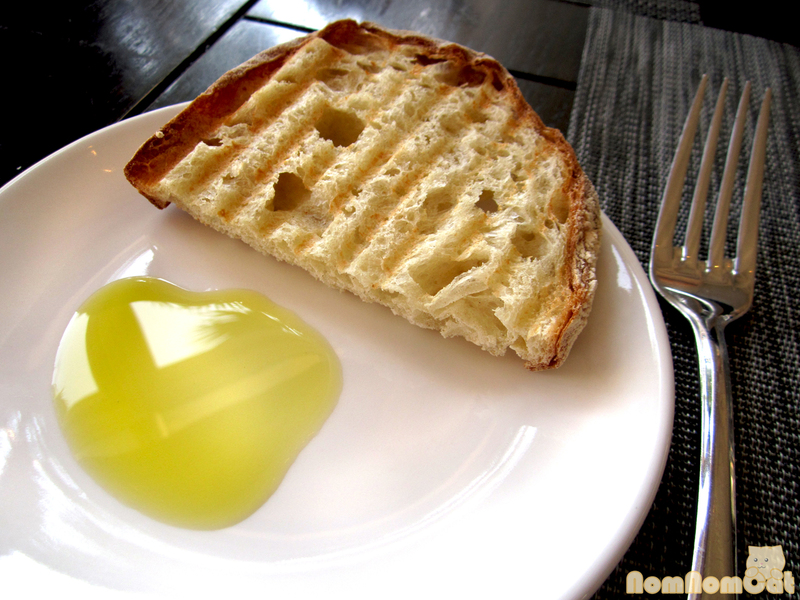 A basket full of hot, panini-pressed slices of fresh bread perfect for dipping into the California olive oil adorning each table. It was so good we asked for a second one! I love when a restaurant serves their table bread warm and Catch took it to the next level. Even the table bread was awesome! 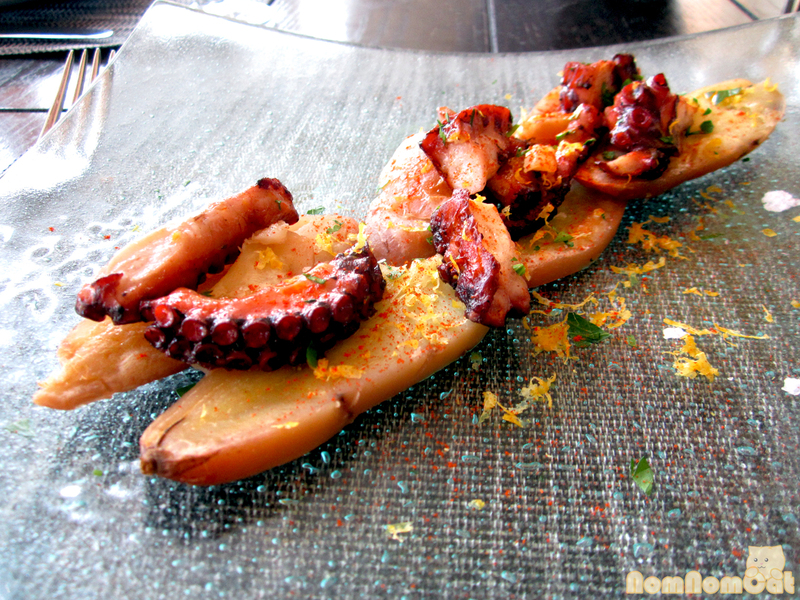 For my first course, I selected the Grilled Spanish Octopus – smoked potatoes, paprika, merula olive oil. 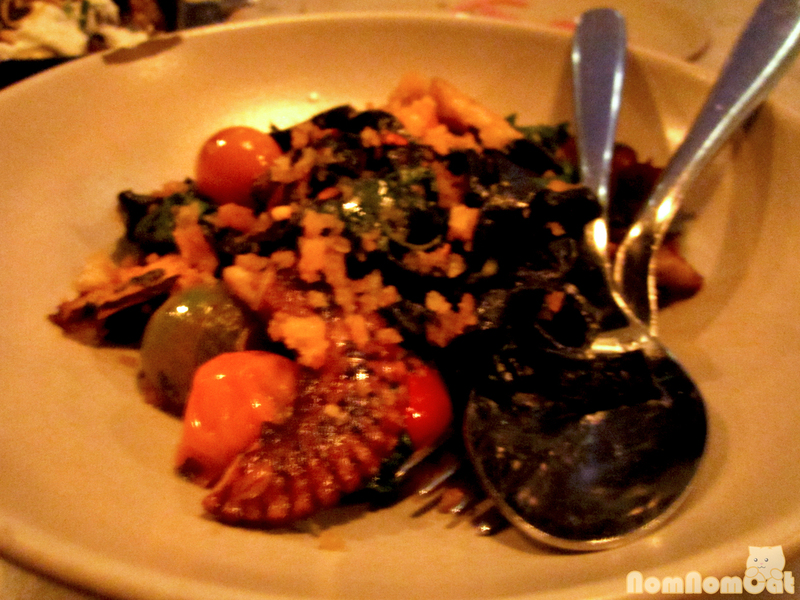 I don’t think I have ever had octopus that tender before. The texture was absolutely incredible, and the flavors melded so well together, especially with the garnish of lemon zest and fleur de sel. 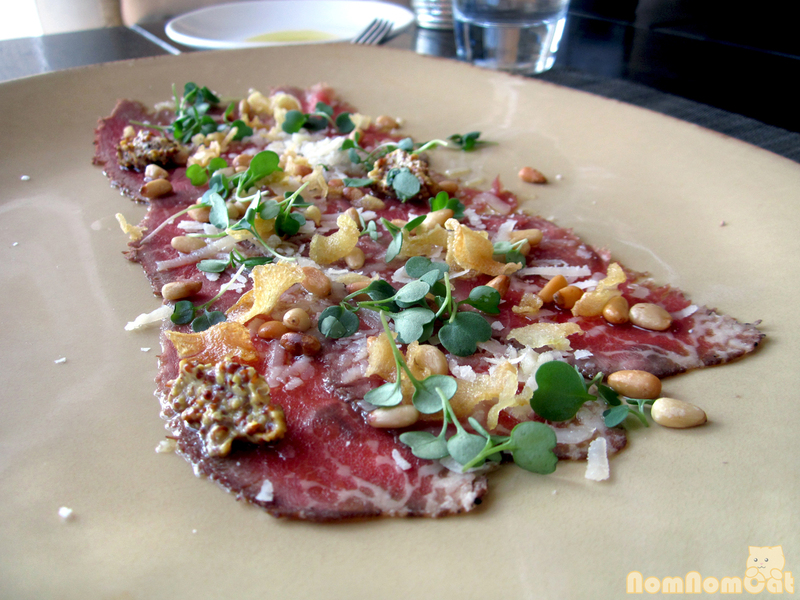 Cass’s appetizer was the Marinated Beef Carpacccio – pine nuts, arugula, garlic chips. 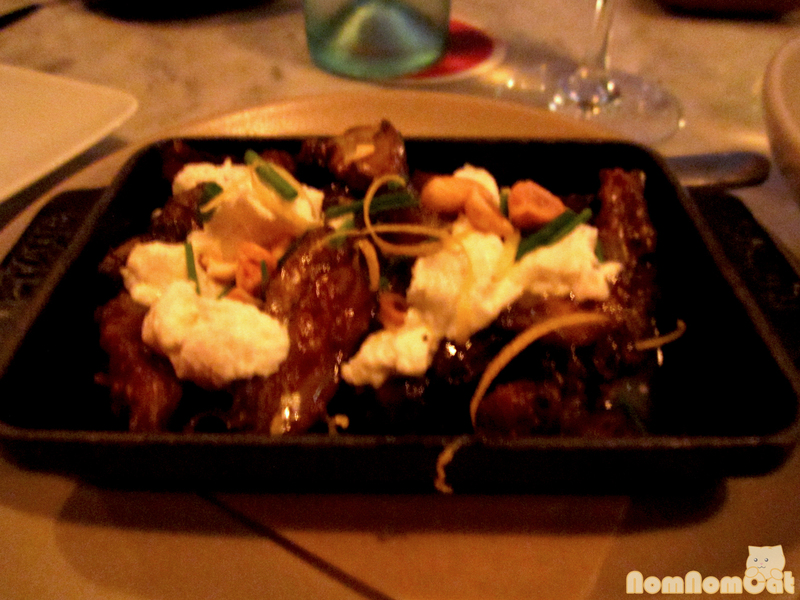 The beef was paper-thin and the toppings (especially the garlic chips!) added a great mouthfeel with the variety of textures. My primary reason for selecting Catch was the entree: Cioppino – mussels, clams, scallop, shrimp, seared fin fish, saffron-rouille crostini. 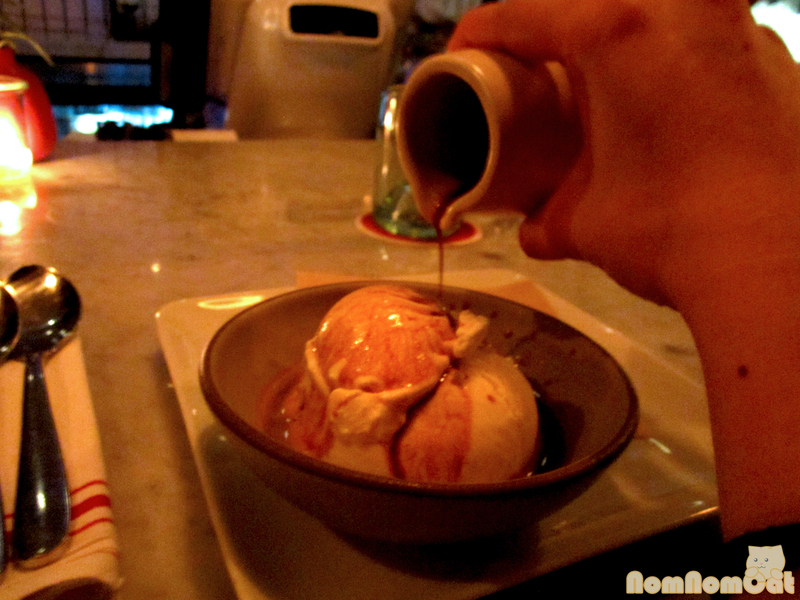 The fascinating part was that the broth was poured in tableside. 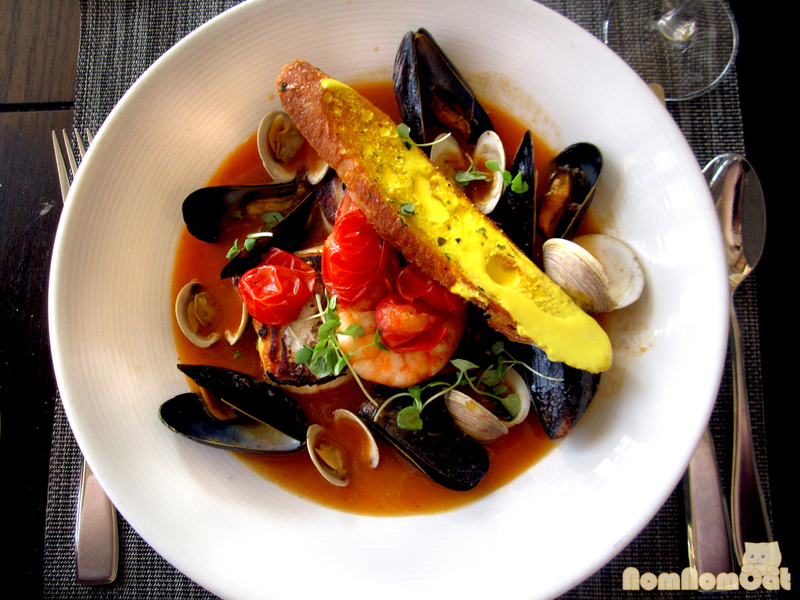 Traditionally a fisherman’s stew of assorted seafood in a tomato and white wine broth or sauce, cioppino is one of my all-time favorite dishes, and this was the first one I have eaten where the components were prepared separately. This method had its perks — the fish was crispy, the scallop had a beautiful caramelized sear, the head-on prawn was smoky, and the bivalves were all perfectly cooked. The portion was generous and incredibly satisfying — with my discard bowl piled high with shells and every last drop of broth scraped clean, I was a happy camper. Delizioso! 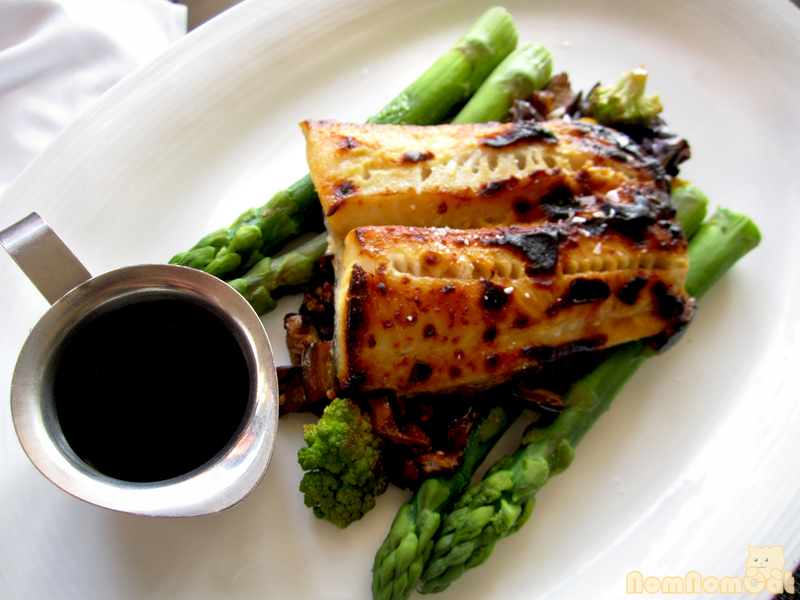 At our server Jeremy’s recommendation, Cass had the Mustard Marinated Black Cod – roasted shiitake, sunchokes, green asparagus. I don’t know where Catch sources their asparagus from, but these were massive! The fish looked tender and flaky, and the silence that fell over our table as we both focused intently on our entrees told me that she really enjoyed it. 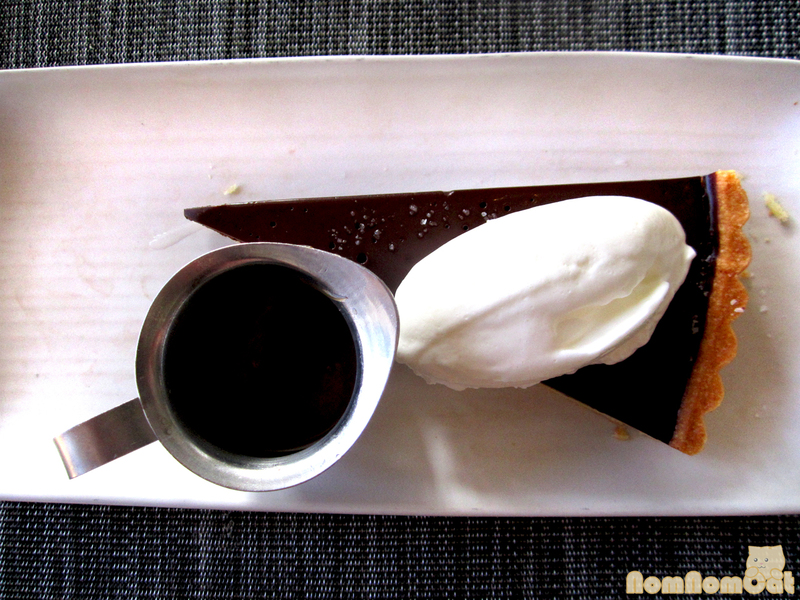 Of course, there is always room for dessert! 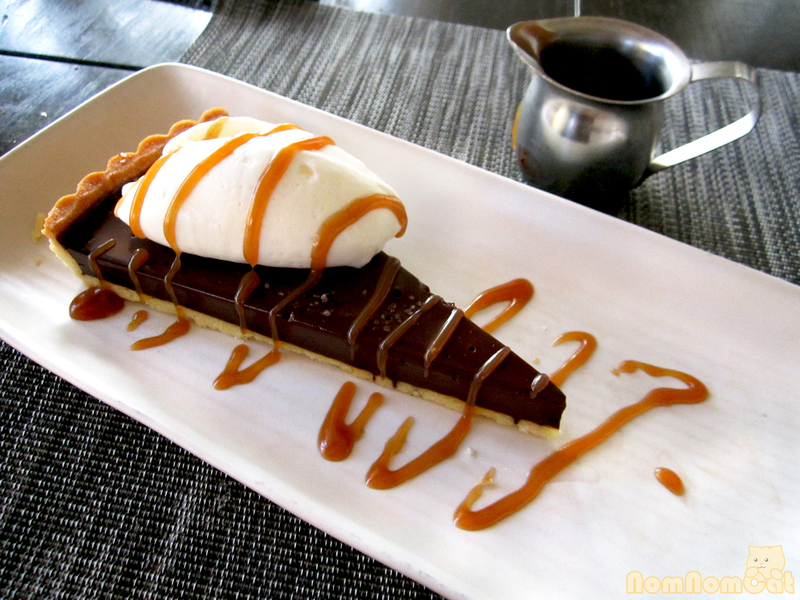 It was a tough decision, but I ended up choosing the Chocolate & Espresso Tart – warm salted caramel sauce. It was like a blast from the past – at first glance, it bore near-identical resemblance to the dessert that Martin and I had while aboard the Napa Valley Wine Train. After just one bite, however, the difference was clear — the tart crust was crumbly, the ganache filling was velvety, the fluffy homemade whipped cream could not have been further from the canned stuff, and the DIY (drizzle it yourself) salted caramel sauce was simply stellar! 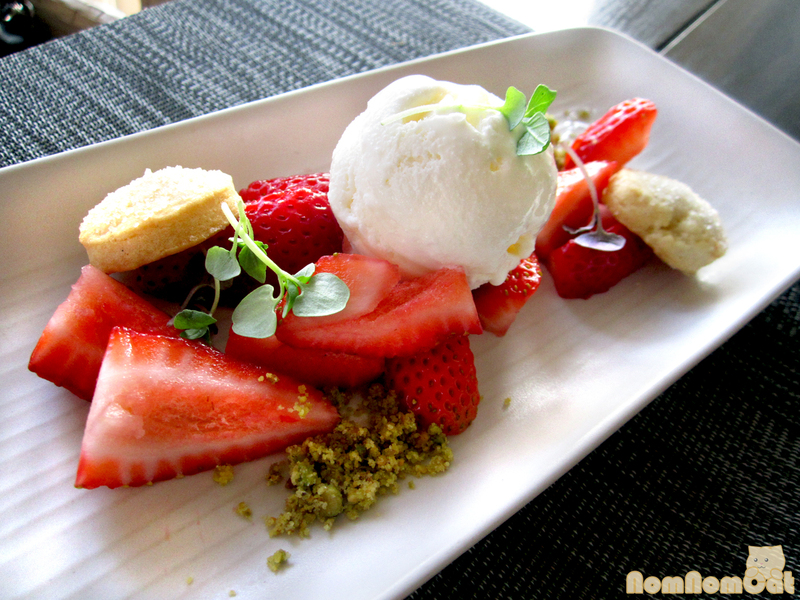 Cass weighed her options and finally settled on the Market Strawberries – short cake, pistachio streusel, creme fraiche ice cream. 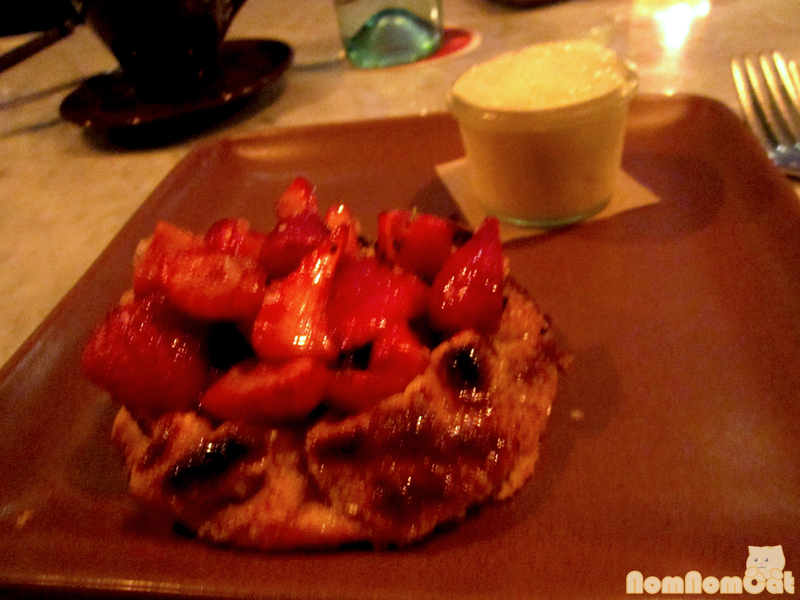 The strawberries looked so fresh and the short cake biscuits were adorable. The pistachio streusel added a lovely splash of color that made the dish shine. A refreshing way to end the meal! 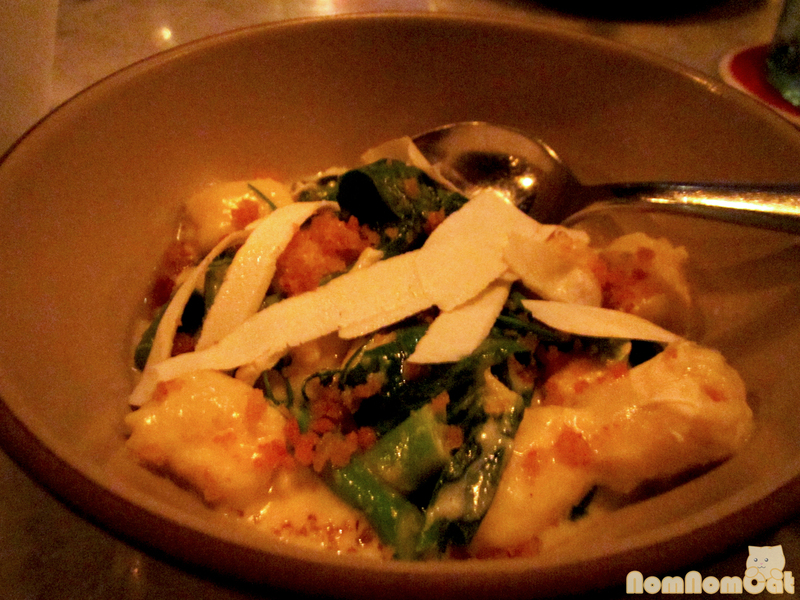 The dineLA 3-course dinner was a $$ – $35.00 per person. The food was well worth it, but what really made our evening was our server Jeremy. He was considerate without being overly attentive and he humored our requests for pictures, even counting off in 日本語. 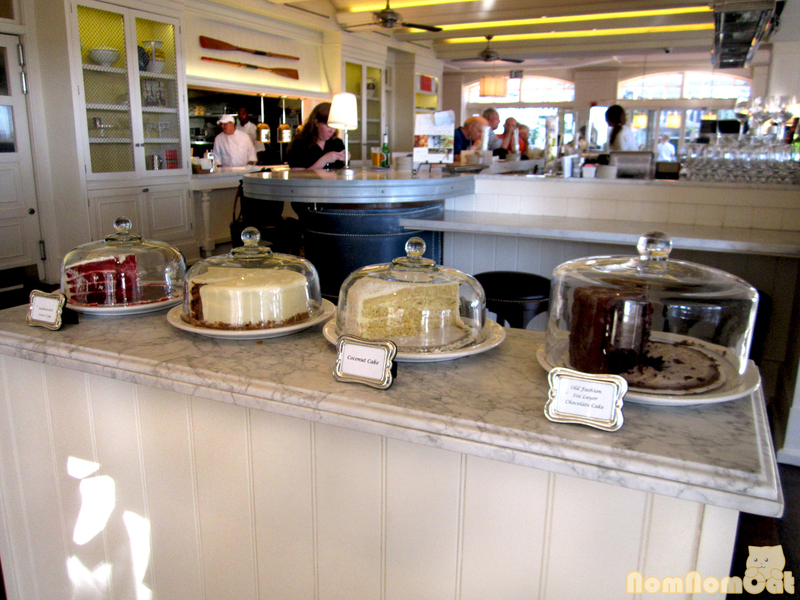 I’ve found that some dineLA experiences can feel rushed because of the sheer volume of diners, but Catch embodied the laid-back beach lifestyle while serving elegant, delicious dishes. 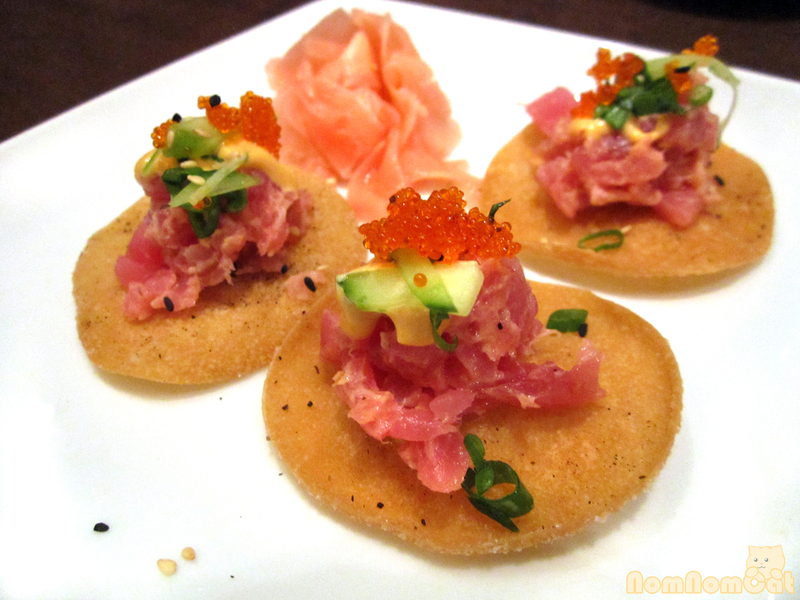 Hurry, only 5 days left to participate in dineLA restaurant week! 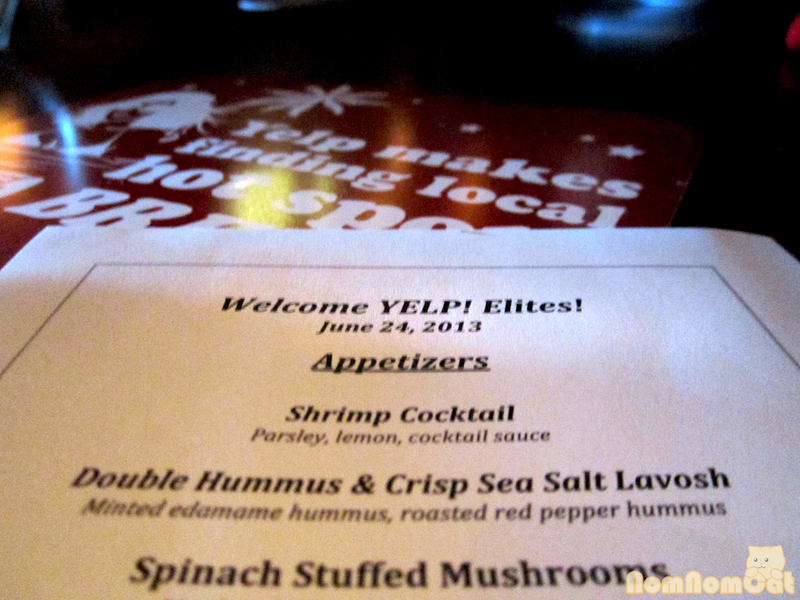 The Yelp Elite – kinda sounds like some sort of secret society, doesn’t it? Though browsing crowd-sourced restaurant reviews has become ubiquitous especially among those with smartphones, a lesser known aspect of Yelp is the Elite Squad – a collection of members who post high quantities of quality reviews, photos, check-in tips, and other contributions to the Yelp Community. One of the perks of being Elite? The opportunity to experience new restaurants (and older ones looking for a fresh perspective) with 100 of your newest friends. 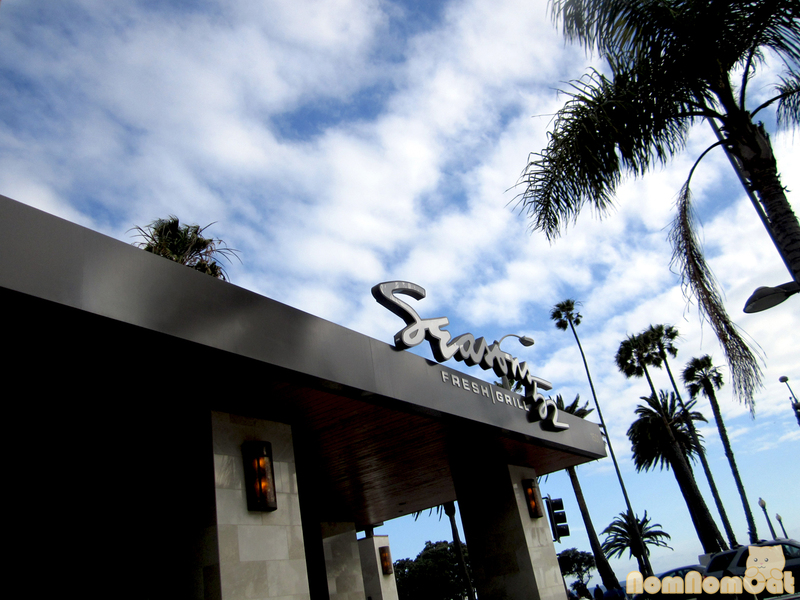 Cass and I went to such an event this past Monday at Seasons 52, a new New American restaurant just across the street from the beach here in Santa Monica. We had arrived early, so we spent some time hanging out by the bar and admiring the stunning decor. 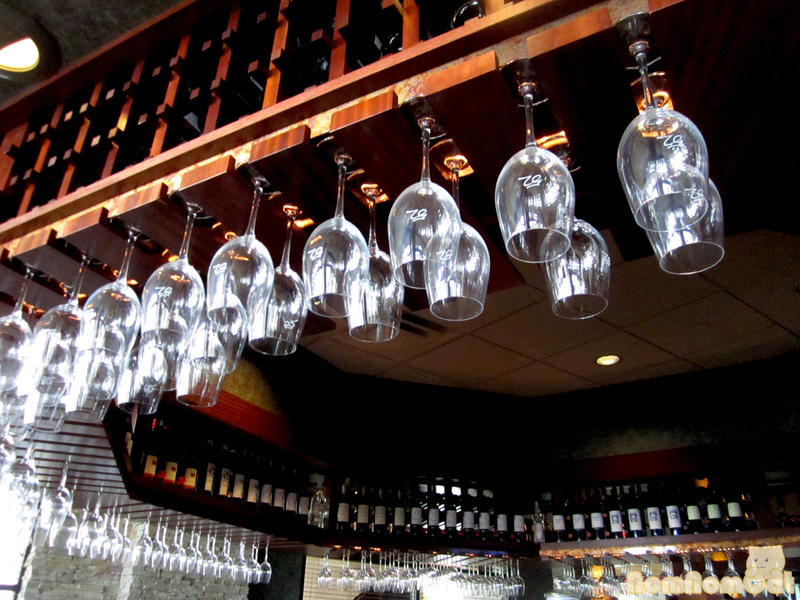 Warm, inviting wood trimming, crystal clear glasses all emblazoned with 52, bottles upon bottles of domestic and imported wine… we could tell that this would be a great place to return to for happy hour. 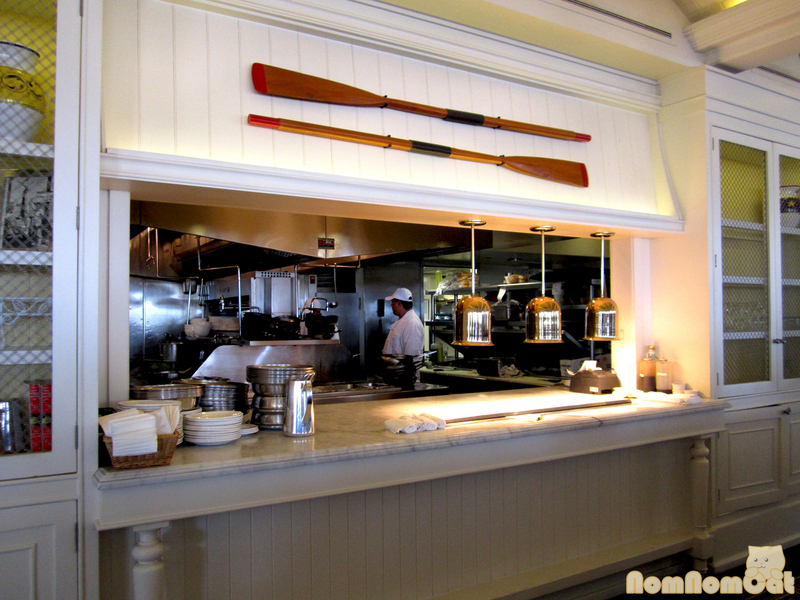 After checking in, we were invited into a large private dining room set up in the back of the restaurant. The long tables seating ten at a time hinted at the evening’s family-style meal. Seasons 52 even printed cute little menus that read “Welcome YELP! Elites!” across the top. Brownie points! 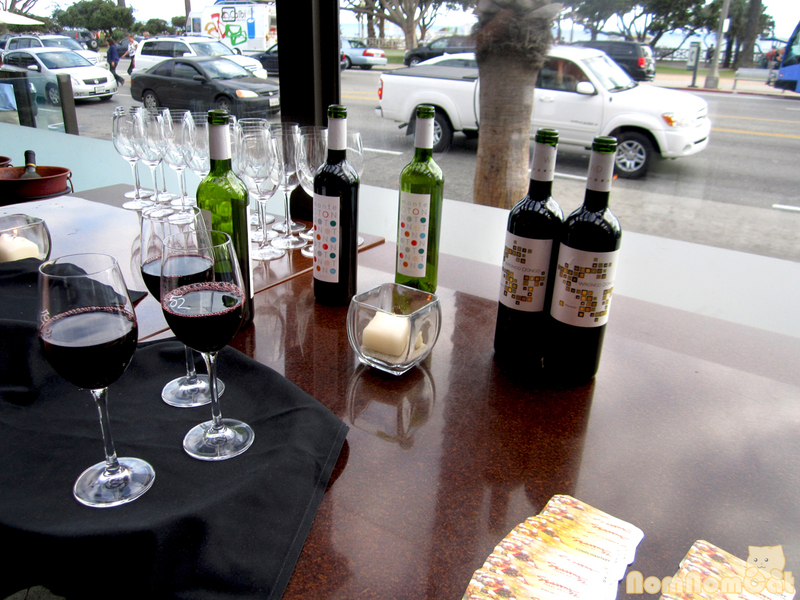 Three varieties of wine were endlessly flowing throughout the evening – a sustainable Sauvignon Blanc from Honig in Napa, a Monastrell from Wrongo Dongo in Spain’s Jumilla region, and a Garnacha from Alto Moncayo in Spain’s Campo de Borja, known as The Empire of Garnacha for the prevalence of the namesake grape. 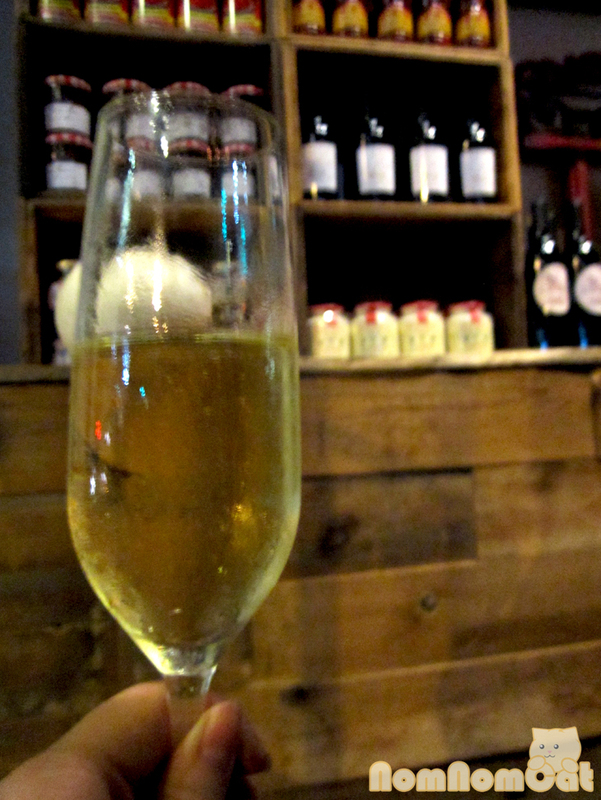 We sampled the white first – crisp and ice cold, it turned out to be our favorite of the night. 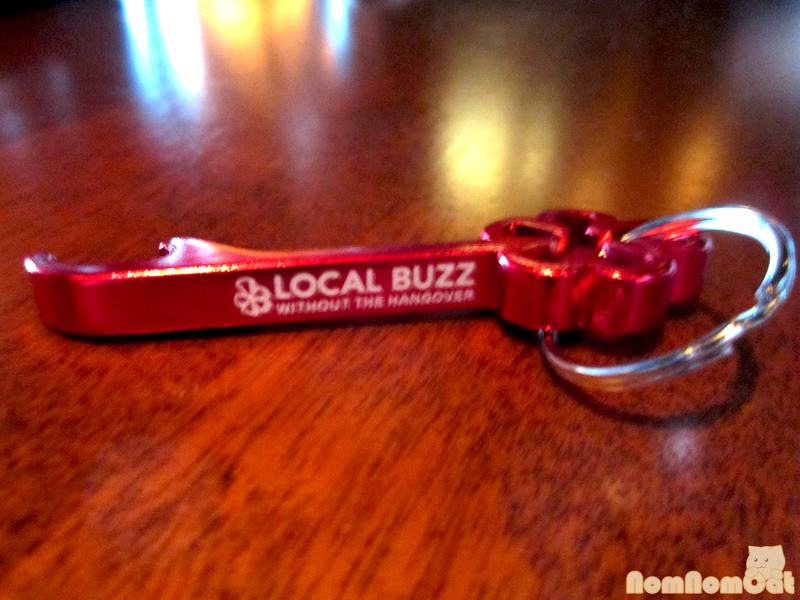 Every table was decorated with Yelp SWAG from shot glasses to bottle openers to paper fans. While mingling with fellow Yelpers and waiting for the food to arrive, we kept busy by trying to figure out how to add our new-found friends through the Yelp App. 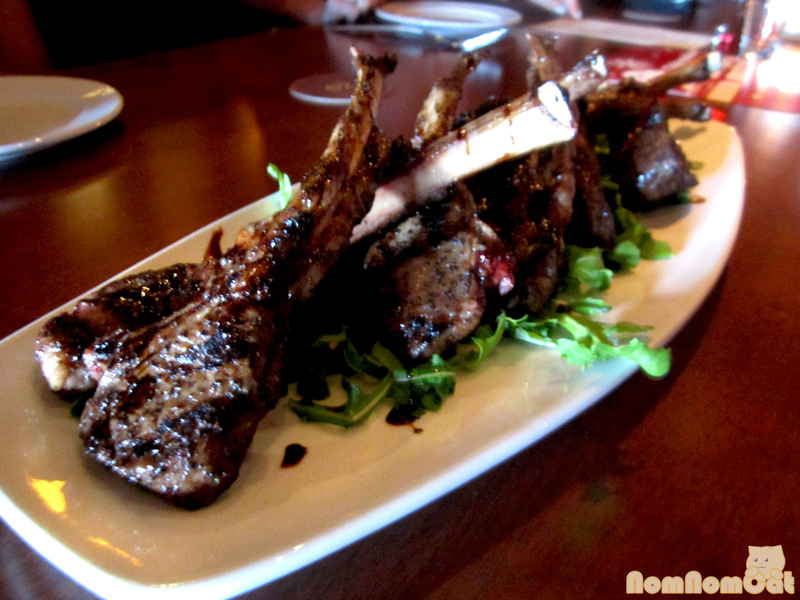 Our table was presented with the lamb chops first, and what a great start it was! 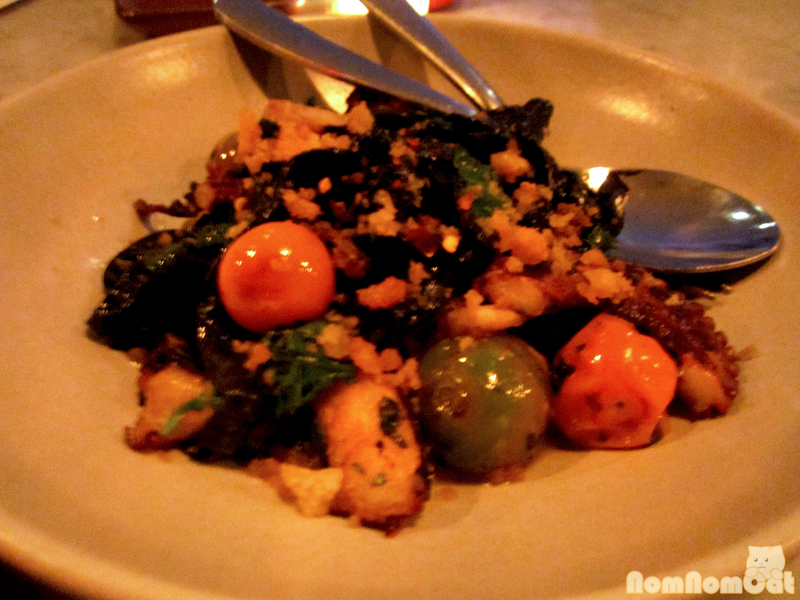 This also turned out to be the best dish of the night, hands-down. The rub was sweet and smoky and reminiscent of really good kalbi, the meat was tender and juicy, and the Frenched bones allowed us to enjoy this as a “finger food” of sorts. I could have polished off a whole plate of these! Next up was the shrimp cocktail, served with parsley, lemon, and cocktail sauce. It was good but nothing particularly special. 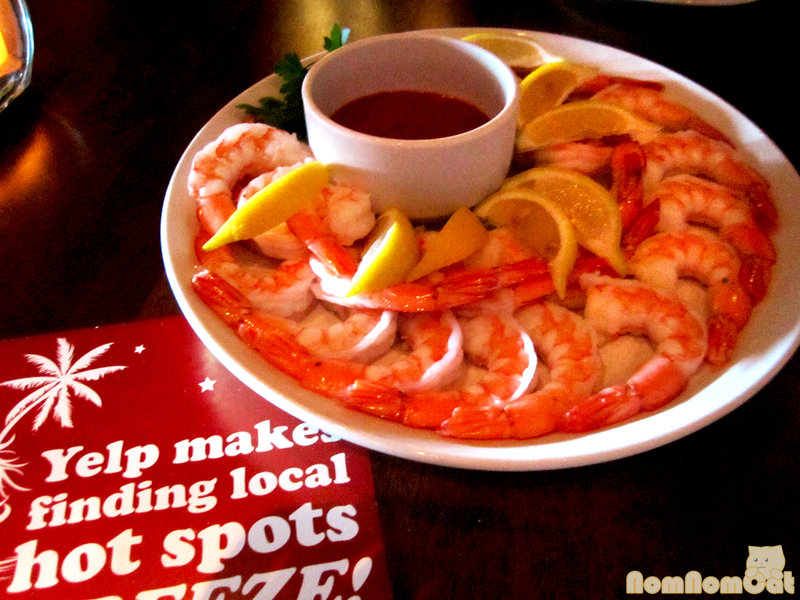 The shrimp were all parboiled until barely opaque, and the serving portion was generous for our table to share. What’s the green stuff? I heard murmuring throughout the room. A quick glance at the menu revealed the identity of the mint and edamame hummus, a delicious modern spin on traditional chickpea hummus. Its partner in crime was a flavorful roasted red pepper hummus. 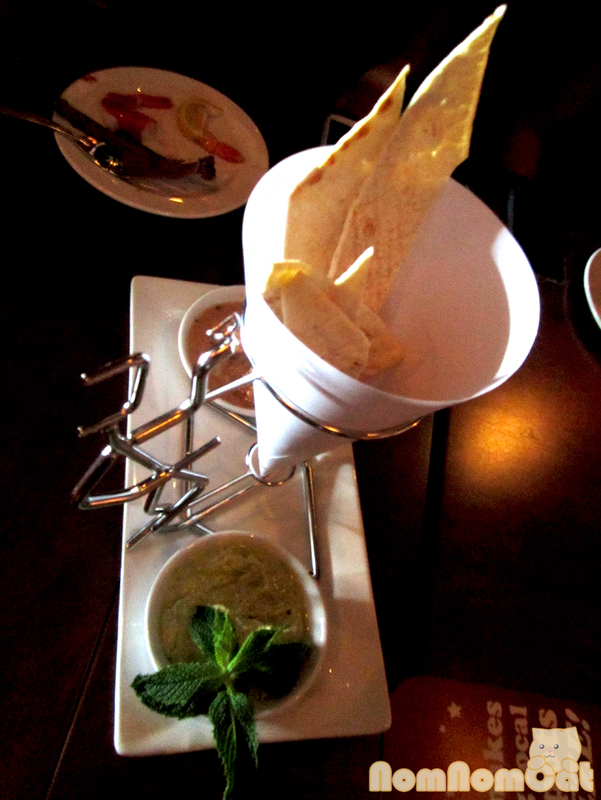 The lavash strips were crispy and made for excellent carriers of the house-made hummus. We then ventured south of the border with these hot and crispy chicken quesadillas with grilled chicken, pico de gallo, and melted cheese. I liked how some of the bits of cheese went astray and turned extra crispy on the griddle. A twist of lime and I was a happy camper! I really enjoyed these cute little bite-sized treats, and I would love to borrow the recipe for a party sometime! (Hint, hint.) 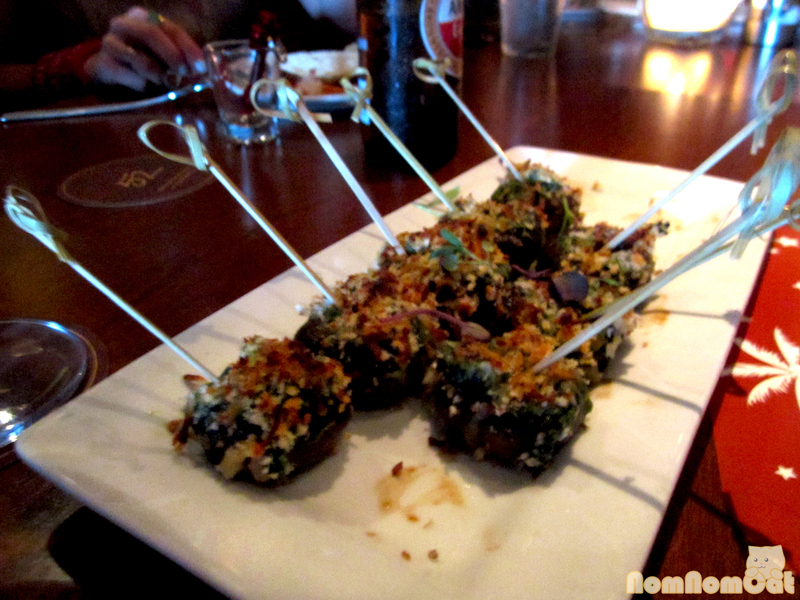 The portobello mushrooms were juicy and hearty, and the spinach added such a substantial filling that you don’t even miss the cheese or meat or seafood that other, more fatty stuffed mushrooms usually wallow in. The crunchy topping of parmesan and panko really brought the whole bite together. No healthy Californian / New American type of place would be complete without a fresh sushi roll, but unfortunately this roll was not a great representation. The soy paper wrapping was interesting but the rice was hard and not formed properly (too squished?). 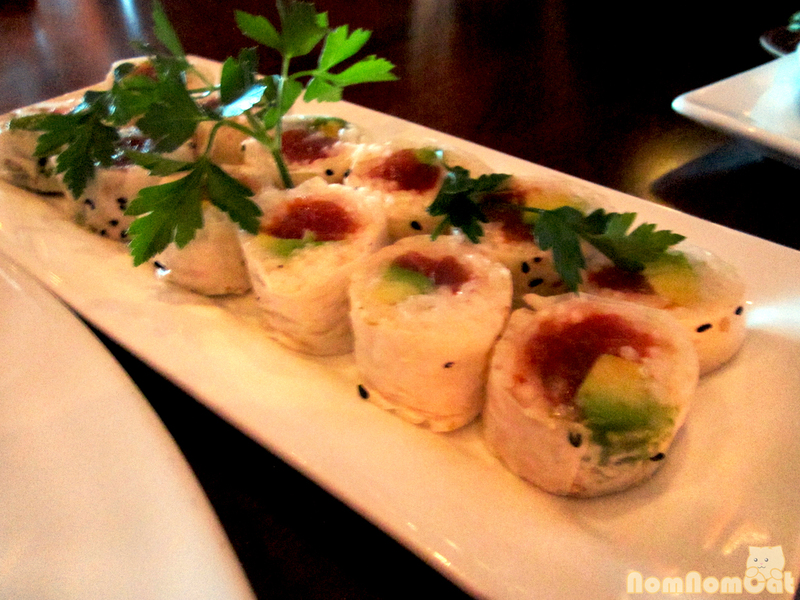 The tuna and avocado did taste pretty fresh, so that was a saving grace. Our table nearly missed out on the flatbreads (there was some miscommunication regarding which tables were served what and in what order), but luckily Community Manager Brittany B saved the day and we were able to try them both. 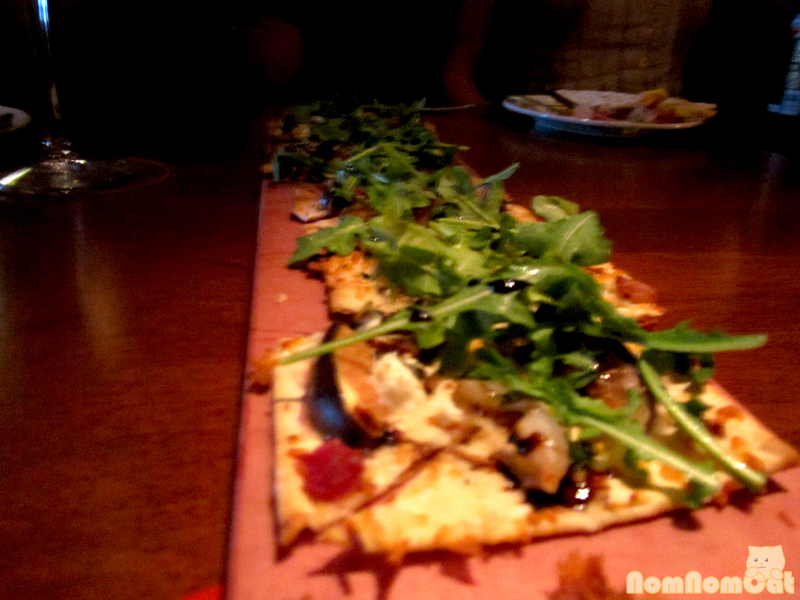 The fig and goat cheese flatbread was pretty good. 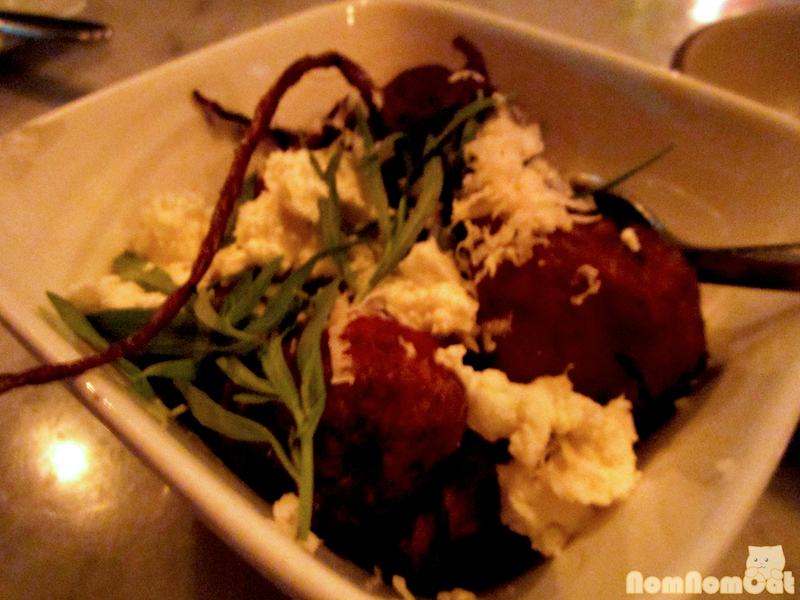 The menu described it as topped with applewood smoked bacon, sweet cipollini, arugula, 15-year balsamic, and fresh mint. 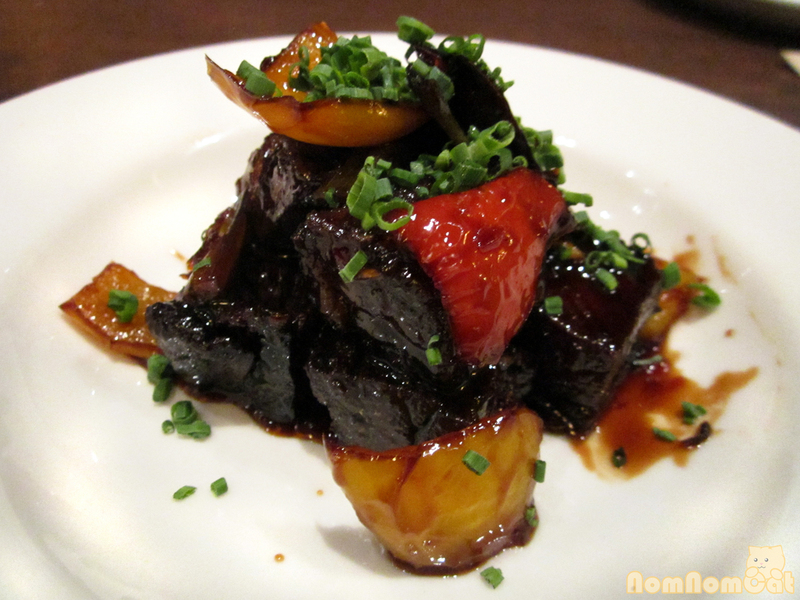 I liked the sweet balsamic glaze that was drizzled over the top; it really tied together the hodge-podge of toppings. 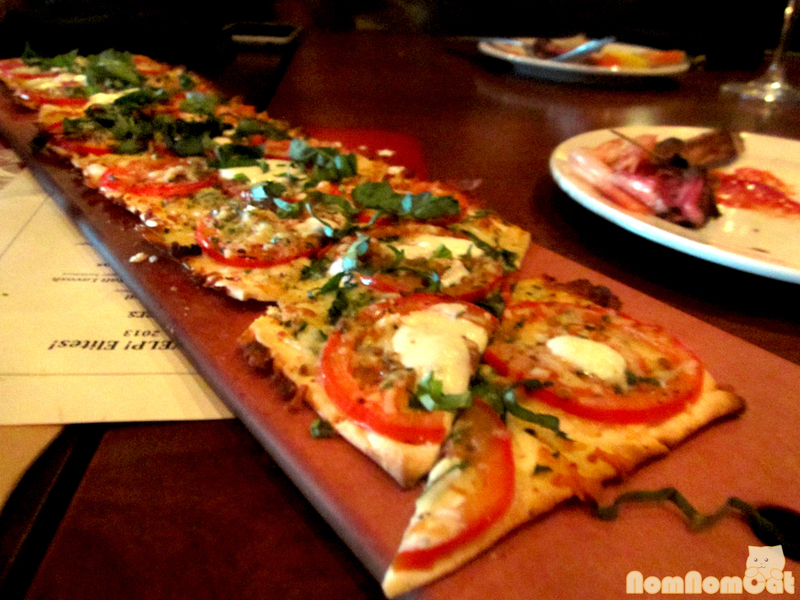 And finally, the tomato flatbread, reminiscent of a margherita pizza. The flatbread itself was a bit dry and cracker-like, but I really enjoyed the fresh tomato and the generous sprinkling of chiffonade of basil. This tasted great paired with the Garnacha. All in all, we really had a great evening. Many thanks to Brittany B for pulling together such an awesome tasting event, and cheers to Erica and the team at Seasons 52 for their hospitality, friendliness, and delicious food and wine! 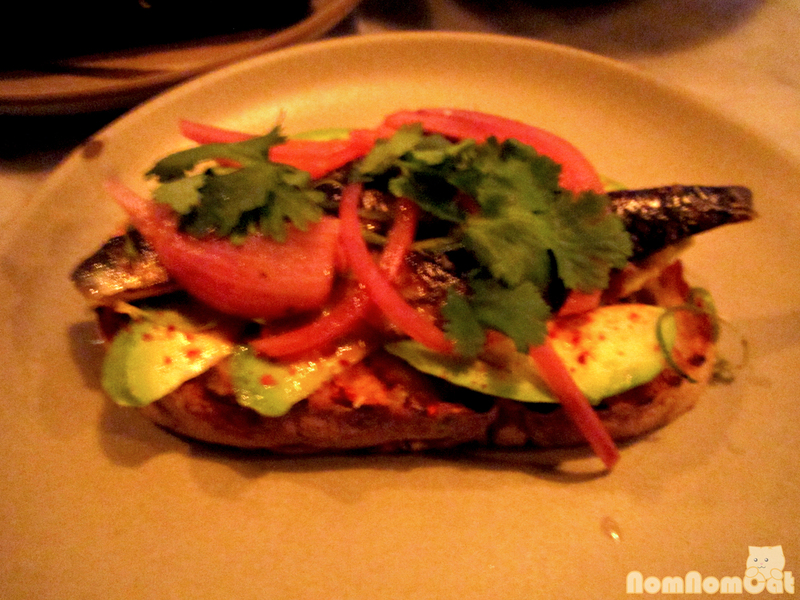 I was impressed with the staff’s ability to juggle so many tables of hungry Yelpers with such grace and efficiency. This was my sixth Elite event and though each one was different, there are not many restaurants daring enough to host a sit-down, family-style meal for this many people, all of whom are avid review writers. 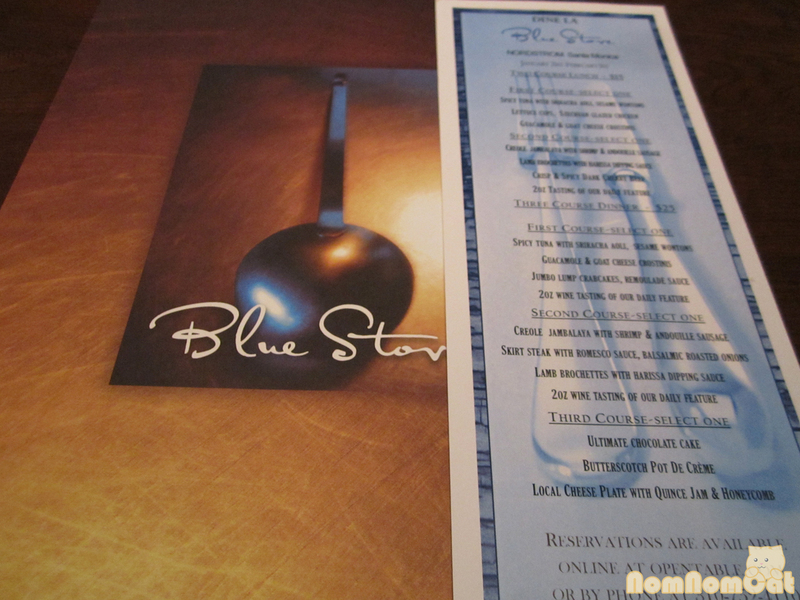 I think they did a great job, especially with the way they smoothly handled the minor hiccup our table encountered. Not near Santa Monica? 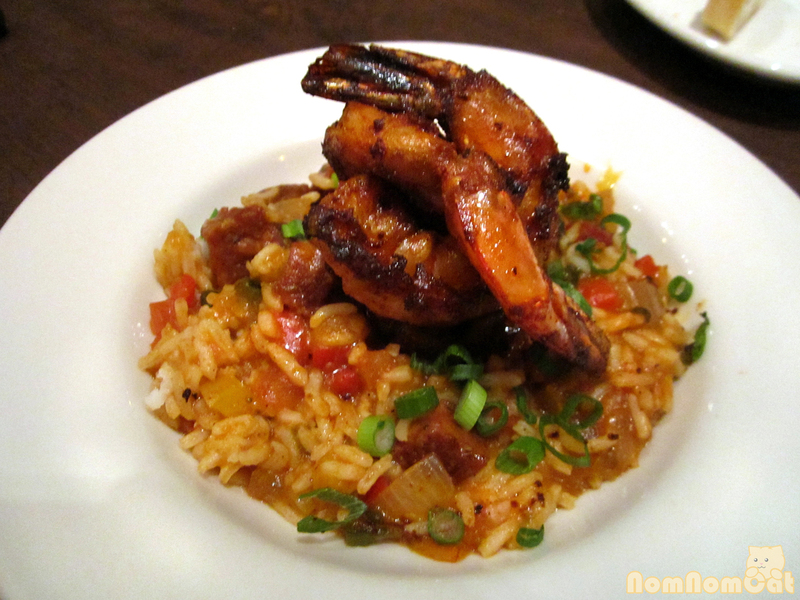 Fear not – Seasons 52 has 39 locations nationwide – check out their website to find the one nearest you!